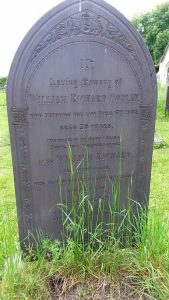 William Richard Copley (born 1893) was the only son of (William) Richard and Hannah Copley of Westborough. The family had farmed in Westborough since the early 1800s and Richard had worked on the farm until, in 1900, he took over (from Mr Brewster) as licensee of the Blue Greyhound Inn in Westborough (now the Old Tavern, Bakers Lane). After he died in 1902 Hannah ran the pub for a while. But by 1911 Hannah, William and his elder sister Margaret had moved to 39 William St, Newark, where William became an apprentice in an ironworks. He later worked for Ransome & Marles and joined the Church Lads Brigade. In September 1914 he joined 1/8th (Volunteer) Battation, Sherwood Foresters at Newark, though he’d previously been rejected by the territorials because of his teeth. They sailed to France on 1st March 1915 and deployed to the Ypres salient. William Copley was shot in the head a few weeks later, on 13th April 1915. He was the first casualty from the Newark territorials and the first ex pupil of the village school. He was buried in Kemmel Chateau Military Cemetery and is named on the war memorials for Ransome & Marles Works, St Marys Church Newark and Newark cemetary, as well as on his father’s gravestone in Westborough churchyard. His widowed mother Hannah married Archibald McCallum. Curiously they seem to have married twice, 1914 in Bridlington and 1918 in Nottingham.